As most of you know, Meta Trader is the most popular Forex trading platform. It’s frequently used in options trading, too, specifically for conducting analyses. In options trading, MT4 is used purely for analyzing whereas the entering of trading is done via the options’ trading platform e.g.at www.iqoption.com. What about using Meta Trader for Forex? Knowing that the number of options you have is more than just two (sell or buy), you can significantly eliminate the risk at the point of entering a trading order. 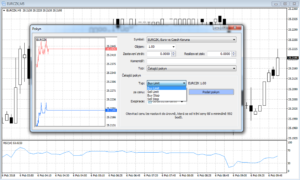 Meta Trader 4 or its latest version Meta Trader 5 is the most widespread trading platform in the world. The reason is its intuitiveness: With MT4 even a total beginner will quickly orientate. The easiness of navigation is a quality also appreciated by Forex professionals who need to quickly enter a trading order. Objectively speaking, program-wise Meta Trader is quite a cumbersome tool. You would surely find more elegant and somewhat faster software tools than MT4. However, these types of software often represent a proprietary solution offered by individual brokers, whereas for a trader the maintenance of such software is too expensive. Normally, in the left upper section, you will see a button „new order“. By clicking on this button a new pop up window will open. This is where you can enter your order. Before taking this step, we will return one step back. 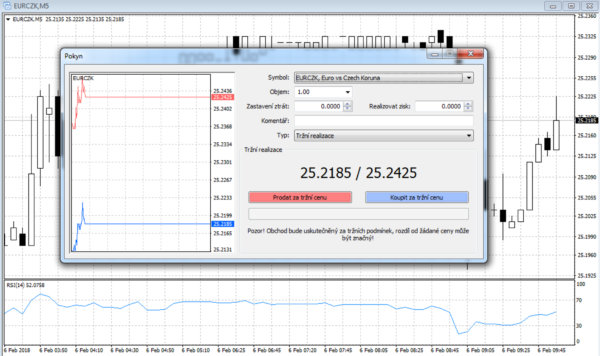 Meta Trader offers control using keyboard shortcuts. The F9 key is used for opening a trade. When it comes to Forex trading, sometimes fractions of seconds may be critical. This is exactly where a shortcut can help. I personally use shortcuts because they are no doubt the fastest way of entering a trading order. Now, looking at the pop-up window you can enter a trading order. Obviously, you can enter the traditional buy or sell (executed instantly). On the other hand, you don’t have to confine yourself to the two. What you can also do is use limit orders i.e. buy and sell limits. 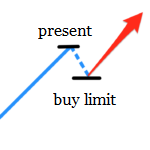 The buy limit is executed once the price falls to your selected price (now you find the price too high expecting decline – buy limit – followed by an increase). The sell limit works in the opposite direction. The order is executed after reaching a preset level. However, if you expect that the price will continue to grow by a few points and then, after exceeding a certain level, a new significant growth will start again you should use buy stop, or its opposite, sell stop. Forex is sometimes seen as a tool for generating unlimited profits or losses. In theory, this is true. Nevertheless, since you are not a gambler but a serious trader you must keep things under control. 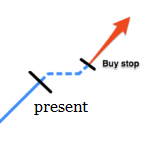 This is why you shouldn’t forget – when entering a trading order – to define your stop loss (a point at which a losing trade will be stopped) or take profit (a price level at which a profitable trade will be stopped). If you strictly follow the Forex trading strategy Forex trading is a safe undertaking. Your discipline and consistency in entering trading orders play a key role. Let’s sum up the issue: Binary options trading is realized using a special platform. This happens most frequently at a specific website. After logging into the system, two buttons CALL and PUT are displayed on the screen. The majority of Forex brokers uses the MT4 platform or software whose principle is similar to MT4. For instance, Plus500 has its internal software. The best way to understand how trading works is to test it on your own. Most brokers offer their demo accounts designed for this particular purpose. Pick one of the below brokers and try out trading without a risk!